So the other day I was talking about how I updated my fireplace. I decided to give it some sparkle today. I was wrapping presents and it hit me. How cute would this paper be on the fireplace!? So here it is my cheap-o decorating tip! 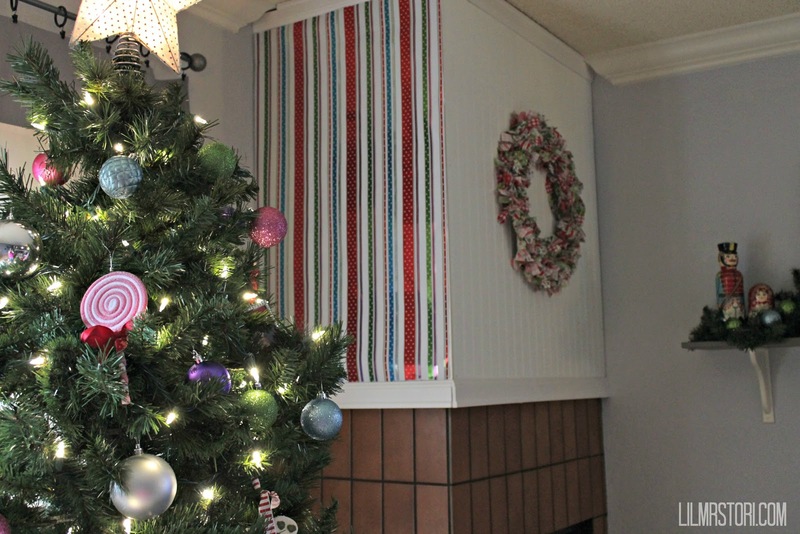 Love it, looks almost like a string of ribbons hanging down, such a fun way to add a pop of colour! I tried this in the kitchen on the end of a base cabinet, worked well until the washing machine leaked! The wreath looks fab too! Thanks Amanda! What a great idea to add some color in the Kitchen. 🙂 Too bad that machine leaked on ya!!! 🙁 Have a great weekend! Such a great idea!! I nominated you for a Very Inspiring Blog Award over on my blog today! Wow! It looks like a completley different fireplace!! You can change it with the season or mood too and for cheap! Fabulous idea! That looks really cute, what am inexpensive trick!